By now, every budding fashionista has gone through multiple notebooks, taking copious notes of Sonam Kapoor’s wedding ensemble. Like we imagined, the wedding goals have been set for all the brides-to-be this year. After flaunting subtle pastel and ivory shades at her pre-wedding ceremony, Sonam’s elegant floral motifs wedding lehenga proved that you don’t always need to be quirky and that traditional can be bae. While everyone expected the diva to flaunt something vibrant at her grand reception, Sonam’s earthy-toned graphic lehenga stunned took everyone by surprise. Designed by none other than Anamika Khanna, the grey and white chevron pattern lehenga was embroidered with metallic threadwork. To give the attire a unique Indo-western twist, the dupatta was replaced with a cape jacket and not pairing it with tons of jewellery (just like her wedding), Sonam chose to go for a four-layered polki neckpiece. With her hair left open, Sonam once again went for a minimal makeup look and opted for a bold lip colour to make her look stand out. 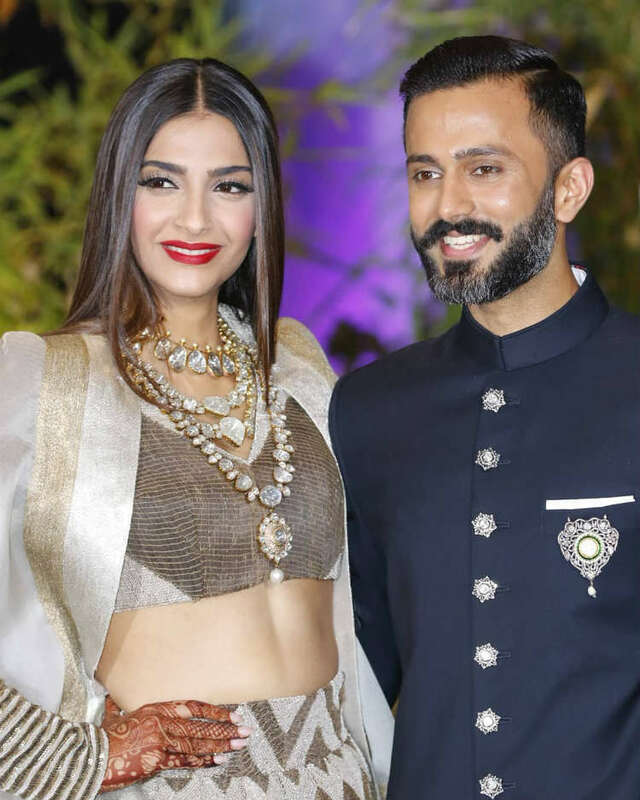 While Sonam Kapoor made all heads turn with her yet another bridal avatar, it was Anand Ahuja who stole all the limelight with his unique look. Wearing a navy colour bandhgala from Raghavendra Rathore, Ahuja paired the outfit with nothing but Nike sneakers. Yes, a pair of sneakers! Now, this may sound or look a little weird, but we think it’s really cool and is something no one has ever dared to wear. What do you think of this gorgeous experimental fashion look of the newlyweds?